Assortment of brushes and sponges in different sizes. 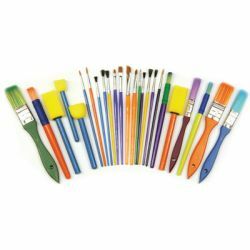 Includes flat top art sponges, wedge tip sponges, 1" painters, flat tip brushes, round brushes, art brushes, flat angle tip art brushes, tapered round tip art brushes, and black bristle round art brushes. Set of 25.